Winchester teak is hand crafted by time served craftspeople and has a smooth finish and rounded edges throughout. The joints are hand-cut mortice and tenon reinforced with teak dowels to ensure the sets suitability for long lasting regular use. 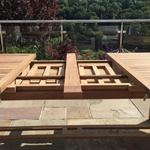 And teak is, by far, the most enduring and hard wearing timber for use in outdoor furniture. The high oil content and dense nature offer it natural protection against the weather all year round. The reddish, honey coloured hue of the teak shines alluringly in direct sunlight as well. As the ageing process occurs the timber will go a silver-grey colour which is adored by many. For cosmetic purposes this can be removed and our Teak Care Products will help you with this. This is available with either oval or rectangular ends. The design of our Winchester Teak Dining Sets hinges around elegant appeal and long lasting stability. The chunky extending table in our Winchester 8 Chair Set has a folding double leaf section meaning it extends in three positions – 1.8, 2.4 and 2.7 metres. The leaf sections are held in place by solid brass fittings. A sturdy bottom stretcher provides added support for the leg unit with the legs themselves being chunkily tick with solid plastic caps on the feet. The inset position of the leg structure offers plenty of room for those dining around the table – another great feature of the Winchester Design. These are 3.5 metres by 2.5 metres in diameter and hand finished from laminate bamboo with stainless steel fittings and canopies spun from the highest quality olefin fabrics. A parasol hole is included in the extending table along with a teak plug for when it’s not in use. These have high, angled backs, plentiful seating and are smoothly hand finished to the highest standards of craftsmanship. The armchairs also have ergonomically shaped arms for that luxury appeal and there is an option to add two of these in the dropdown menus. The dining and armchairs are also stackable meaning they can be stored away discreetly in the winter months when they may not be needed. Please call our friendly Sales Team in the Midlands for further assistance and support.